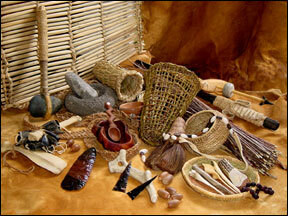 This skills program introduces our series on primitive technologies. You always see cavemen portrayed as stupid and comical. But what do you suppose they knew that you don't? We hear from Norm Kidder. He's the vice president of the Society of Primitive Technologies. He talks about the society's goal to re-learn, study, and teach stone age skills. Norm explains that using cutting edges and fire were the first technological skills developed by the earliest humans. In addition to the Society of Primitive Technologies, another source of primitive skills education is the Northern California group, Primitive Ways. We'll hear more from Norm Kidder in a future edition. The series will continue several weeks from now when we learn the specifics of several primitive skills.